So far this winter has been a big improvement over last year when we were almost drowned. The first half of December the cows were basking in the sunshine wondering if we had moved them to Southern California. Fortunately the great weather allowed me to catch up on things I did not get done earlier this fall. I’m shifting into countdown mode for the first calves about February 1. Really never get over the excitement of the first calf being born hoping it will be the next great Shorthorn. Heritage “Native” Shorthorns have in recent decades been regulated to “the back of the barn” when compared to Modern Shorthorns and Milking Shorthorns. Given this inequality, the Heritage Shorthorn Society was created to help Heritage “Native” Shorthorn breeders preserve, produce, and promote quality Heritage Shorthorns. There is a tremendous opportunity, through the Heritage Shorthorn Society, for everyone interested in Heritage/Native Shorthorns to find out more out about this type of Shorthorn and the advantages that they present. There is a wealth of information at www.heritageshorthorn.org and many benefits to becoming a member. Wading into the topic of the ideal cow seems appropriate with all the interests in genomics and the crossbred Shorthorn Pluses being hyped. Actually no single “ideal cow” exists because of the varied objectives of different Shorthorn breeders and the diverse production/management systems employed. Rather the ideal cow is the cow that best fits an individual breeder’s objectives. It is important to consider the most essential qualities that constitute the make up of every good cow versus the qualities that may make the ideal cow for an individual breeder. Two important factors in designing the ideal are the heritability of individual characteristics, and that trying to select simultaneously for every trait will never work in any cattle operation. It is important to have a cow with most of the good basic traits and then add complementary traits to produce an ideal cow that works in a specific livestock operation. The basic traits that I believe all ideal cows should have include the following: feed efficiency, fertility, absence of known genetic defects, superior sire & dam, longevity, strong maternal instincts, milking ability, polled, structural soundness, and good temperament. Feed efficiency measures the conversion rate of dry matter intake (grass, hay, grain, and other types of cattle feed) into milk/meat. Simply put cows that can maintain their condition under stressful events, such as pregnancy, nursing a calf, or poor quality feed, are more feed efficient. This trait has a significant impact on net income because the more feed efficient an animal is the less expensive they are to maintain in good condition. Fertility includes calving ease and the ability to breed back quickly. Cows should be calving every 12 months with no problems. The old axiom is true that the most important factor for achieving profitability in the cattle business is having cows that produce and raise a live calf every year. Genetic tests should include Tibial Hemimelia (TH), Pulmonary Hypoplasia with Anasarca (PHA), Digital Subluxation (DS), and Myostatin (Double Muscling). Much is known about these genetic defects in Shorthorns with Myostatin only recently gaining significance. There are certain bloodlines in Shorthorns that may have a double muscling genetic problem. Whether this is a natural genetic defect in Shorthorns or is the result of introduction of either Belgian Blue or Maine Anjou genes is up for debate. Cows that come from a superior sire and dam are much more likely to instill those same superior qualities in their offspring. Longevity is often ignored in today’s cattle industry yet it is a significant factor in profitability. With long-lived cows the need for fewer replacement heifers will significantly increase profit and lessen management problems because there are fewer first calf heifers to “train”. The dairy industry has basically thrown the longevity trait “under the bus” as has much of the beef industry. Constant turnover in a herd eliminates the chance of selecting for longevity. Traditional Heritage Shorthorn cows were often productive into their teens. A strong maternal instinct is very important for two reasons. First the cow needs to care about her calf. This is particularly important for calves born in difficult environmental conditions. Second, a cow with strong maternal instincts will teach her calf “the ways of the world”. Most breeders forget about this factor. With a strong bond between the cow and calf, the calf will learn how and where to graze, to find water, to consume minerals, and the other nuances of being a ruminant animal. I can not stress enough how important this is. Please note there is a pronounced difference between a cow having strong maternal instinct versus being aggressive to the point of being dangerous. Recently there have been many articles penned indicating that breeders should select for minimal milk to save money. Personally I consider most of these articles ridiculous. If the beef industry wants to simply bottle feed calves or harken back to the olden days when “nurse cows” were provided for calves then we should all be selecting for less milk. If on the other hand we want to wean calves at 205 days that weigh at least 50% of their dam’s weight then I think milk has to be a critical component. Certainly cows can produce too much milk with resultant udder problems but to say milk in beef cows is not important defies credibility. When discussing milking ability I also include such factors as udder size, udder attachment, and teat size. It constantly amazes me how breeders go to a bull sale, buy a bull, but never once inquire about the bull’s dam and her udder characteristics. Common sense says that the purchased bull’s dam is half the equation and if she does not have a good udder then he is less likely to have daughters who have good udders. 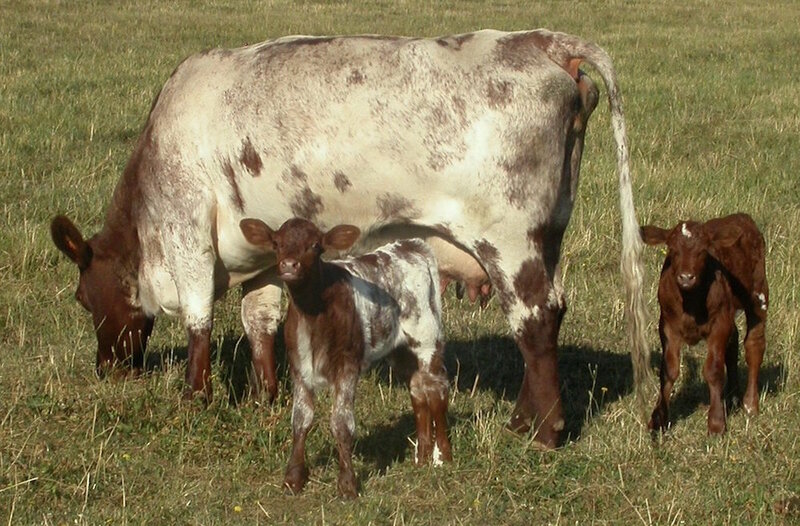 With modern genetic testing, heterozygous polled Shorthorns can be separated from homozygous polled. Most breeders and buyers prefer polled cows but there are still a few who have affinity for horned Shorthorns. With horned cattle, obviously, there are safety questions for other cows and for people. Lately there has been a renewal of a trend from the 1950’s to bury the feet of sale animals in straw. With the advent of online sales this is a real “bonanza” for sellers because they can simply hide feet and leg problems even if the animal is in a video. “Knee deep in straw” was standard procedure in cattle advertisements in the 50’s and 60’s. The fact that so many breeders today are resorting to this technique is strong evidence that structural/conformational feet and leg problems in Shorthorns are on the rise. Good leg structure, along with strong positive conformational characteristics, such as strong tops, smooth muscling, and balanced fronts, will result in fewer health problems and longer lived, more productive Shorthorns. I probably should have started with temperament because it and fertility are at the top of my list of positive traits. We have all heard the term “nervous energy”. In cattle nervous energy equals lost profits. The nervous/excitable cow burns excess calories, is dangerous to work with, is less feed efficient, and often passes this trait on to her offspring. The calm cow does not waste energy, usually is feed efficient, is generally a good mother, and usually is a pleasure to work with. No trait generates more discussion today in the cattle business than cow size. Unfortunately too many breeders believe there is a direct correlation between cow size and feed efficiency. There is not. The tendency to smaller and smaller cows (the new “Belt Buckle” movement) has hit the wall and reality is settling in. Smaller cows equal smaller calves equals smaller carcass weights. 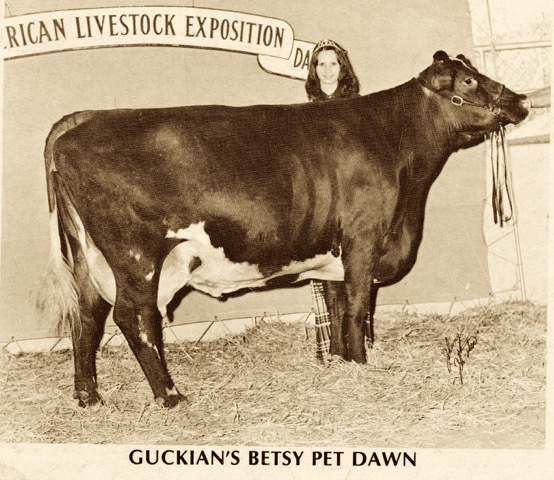 Lately articles are finally starting to appear indicating that cow downsizing has gone too far. I find this encouraging. I think for most cattle operations cow size should be in the 1300-1600# range depending on the breeder’s end product i.e. cow-calf, finished grass-fed beef, milk production, and/or purebred sales. Selecting cows for the environment they will live in is extremely important. Examples include smooth slick haired cows in the hot South, versus hairy Shorthorns in the North to insulate against the cold. Cows that are more resistance to fescue toxicity in areas where there are a lot of Kentucky 31 fescue pastures can have real impact on growth and reproduction. Management systems that are more confined versus range operations will need a different cow type. As an example, in the dairy business, selection for cows which fit in robotic milking systems has become a priority. Cows that are in range operations need to be able to travel to find and select nutritious feed, while cows in a more confined operation need to be more docile and understand what a feed bunk is. Certainly milk versus meat has to be a consideration in Shorthorns since some producers are moving toward grass-fed dairies using Heritage Milking Shorthorns. Grass-fed beef operations need cows that produce faster growing, better muscled and better marbled offspring. Purebred seed stock producers may have to take pedigrees into consideration because of the demands of their buyers. Commercial bull producers will need to take into account excellent confirmation, hardiness, and libido especially for range bulls. There are many other examples but each breeder must decide what is most important for their own “ideal cow” to achieve their production endpoint. When growing or buying a cow each breeder should take an objective look at their goals, facilities, and abilities. Too often breeders become enthralled with the latest trends and “jump on the bandwagon”. The most successful long term cattle breeders take a long view and stick to their principles in selecting their ideal cows. I have purposely left out EPD’s in this discussion. Personally I do not have the faith in them that some breeders do. To me “computer selection” made using possibly “fudged” or inaccurate data inherently has problems. As an example how can weaning weight EPDs be compared when one calf grew up in a grass environment while another had constant creep feed. Another example is Heritage Shorthorns because there is almost no historical data on them and any EPD values are essentially an extrapolation of an extrapolation of an extrapolation. Because EPDs are supposed to be a genotypical comparison the bull with great EPDs may be structurally unsound and not be able to breed many cows. Another factor in my decision is simply the cost of all these tests. Genetic test providers are reaping the monetary benefits of the many “newest greatest” tests. I would rather trust my own evaluations, data, and knowledge when selecting my ideal Shorthorn cow. Classic Dual Purpose Milking Shorthorn. She is the dam of the famous Shorthorn Bull "Columbus"